Article Title: McGregor is unlikely to succeed in reducing St. Augustine. stronghold of the Floridas, and the only avenue to their quiet possession. advances of pay to his men, and thereby conciliated their strict attention to discipline. his orders, without firing a gun. It was also ascertained, by the same means, that the governor of St.
town, had taken up arms for the defence of the place. the port from whence she came. A patriot privateer schr. was said to be cruising off the harbor of St. Augustine, at the time capt. The sloop Gen. Washington, which sailed yesterday for Savannah, has on board a company of U.S. Article Title: "Amelia Island. 'The capture of Amelia Island by Gen. McGregor is confirmed.' 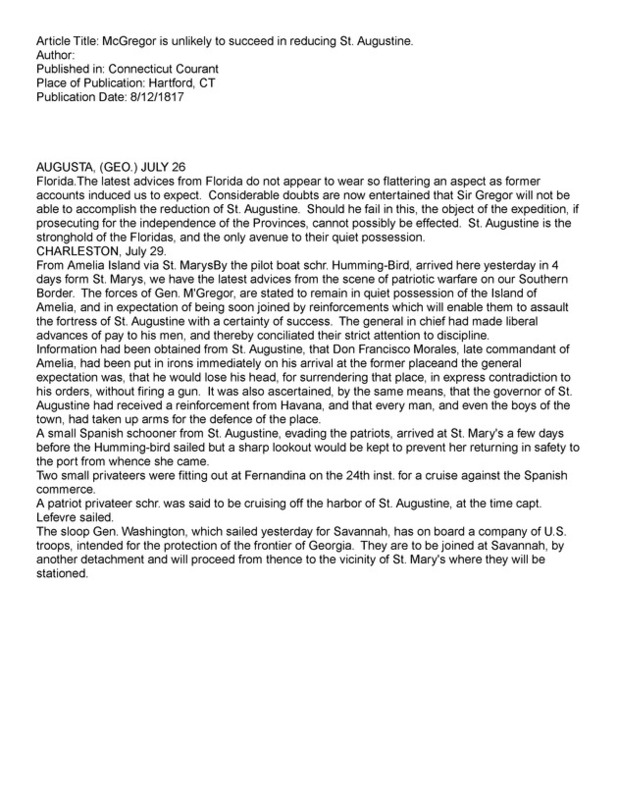 "
Amelia Island.The capture of Amelia Island by Gen M'Gregor is confirmed. His proclamation, dated San Fernandina, July 1, 1817has been received. It is intended to quiet the apprehensions of the islanders. ST. MARY'S JULY 5th.Last Sunday the Patriot force, (as I wrote you was expected) took possession of Amelia Island under Sir Gregor M'Gregor, their commander. Though there were in all about two hundred men on board the transport and a schooner, (the only vessels that were engaged in this service) yet Amelia was taken by the small force of sixty-five or seventy men. Their commander landed with this small party from the brig that had come to anchor between the points of Cumberland and Amelia, on Amelia beach, immediately opposite to the vessel, from whence they marched to Fernandina, a distance of five or six miles. Fernandina, the name of the town on Amelia Island, is defended in front by a fort mounting seven carriage guns six of the them long eighteensand by two block houses in the rear, which command the only way by which an enemy can approach ; and when it was taken there were at least forty men in the place under arms. The Patriot party were obliged to cross a creek in which every man was up to his waist in mud, and which was immediately under the fire of the block houses. Though they might have been cut all to pieces, yet not a single gun was fired. Such was the panic of the people within the town, they did not even discharge their guns before they surrendered. I have been down to Amelia to view the new order of things, that place being only nine miles from St. Mary's where I had the pleasure of seeing the celebrated Patriotic General Sir Gregor M'Gregor. He appears to be about 35 years of age, his height is about five feet eight inches, and he is somewhat inclined to corpulency. His appearance is such, that to meet him even in ordinary life, with ordinary people, one would still fancy there was something uncommon about him. A flag has been hoisted in Florida, the field of which is white with a blue cross. I wish it was in my power to send you copies of the proclamations which have been issued, but I cannot obtain them : the purport of the first was, I understand, to endeavor to establish some discipline among the seamen and soldiers, of which at present there is very little, and induce them by bounties to enter the service for a certain time, as now they are nothing more than volunteers : of the second, to quiet the minds of the inhabitants, and allow them six months to declare themselves in. By the latter proclamation, as I have understood, the Floridas are taken possession of as Territories, dependent on the Republic of Buenos Ayres. It is generally supposed that as soon as a sufficient force is collected, they will march to St. Augustine, from whence, if they are successful, which is extremely doubtful, they will immediately enter West Florida. The inhabitants of the adjacent province, at present, are generally not favourable to the new order of things (having been surfeited with revolutions) more partiucularly as almost every person is attached to the present Governor of St. Augustine, whose character cannot be extolled too highly. Yet they have been agreeably disappointed in the object of the visit : they feared it was for plunder, yet not a single individual has been molested in person or property. Every one speaks in the highest terms of the charactger of the commander, who is accessible and affable to all, and also of the officers generally, among whom are some young men of the finest appearance I ever saw, though order and method (without which no great undertaking can prove fortunate) are not so well observed among them as ought, and perhaps may be after they have been regulated by time. There appeared to me to be about forty young men attached to this expedition as officers, or who expected to be made officers. Sir Gregor Macgregor states himself in his proclamations a Brigadier General, commissioned by the highest republican authorities in South America.Nat. Intel.
" We arrived here on the memorable 26th of June, and after a march of ten miles through the swamps, breast deep we stormed the garrison, which surrendered to us with 70 prisoners. We are now in peaceable possession, and the inhabitants are well pleased. In a few days we move forward to strorm St. Augustine, where there are 500 men in a strong garrison, and are determined to drive them out of it. Our 22 gun frigate, with two hundered and fify men, from N. York, is off the bar. We took two valuable schooners at Fernandina. The Floridas.Our advices from East Florida are to the 6th instant. At that time general Macgregor was on Amelia Island, but one of his parties had advanced to, and taken post at Cowford, a block house about 40 miles from St. Augustine. The general was preparing to move for St. John's, and expected to reach it in a few days ; by which time his forces, it was believed, will be adequate to the completion of their object. As Augustine was short of provisions, the garrison not able to mount half the guns in the fortress, and the patriot fleet before it so strong as to preclude the possibility of any assistance being rendered by the armament which sailed from Havanna on the 11th ult. for its relief, no doubt was entertained for it speedy surrender. After having garrisoned Amelia, St. Johns and Augustine, the main body of the independent army (whose number and resources will be greater than most people imagine) will, it is supposed, move westerly, and attempt the reduction of Pensacola.